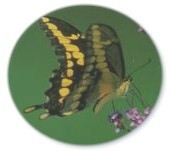 In 2004 twenty-one participants found 992 butterflies of 44 species. The Ojibway Prairie Complex received the majority of coverage. Sites visited by counters included Spring Garden Natural Area, Tallgrass Prairie Heritage Park, Ojibway Park, Black Oak Heritage Park, Ojibway Prairie Provincial Nature Reserve and Brunet Park. The count was hosted by the Ojibway Nature Centre. The Friends of Ojibway Prairie sponsored a picnic lunch and Pepsi provided refreshments. Despite having beautiful weather for the count the total number of butterflies counted was only 56% of average. 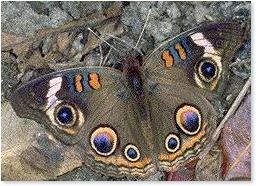 Perhaps the cool wet weather this spring had an adverse impact on the butterfly population or delayed the emergence of mid-summer butterflies. Four Eastern Commas tied the previous high count for this species. As usual, the count recorded an good variety of skippers (14 species). Other insects of note included Brown Mantidfly and Nessus Sphinx at Spring Garden Prairie. 67 species have been recorded over the past eleven butterfly counts. Maurice Bottos, Margaret Calder, Heather Anne Campbell, Karen Cedar, Jerry Clements, Paul DesJardins, Kristen Fawdry, JoAnn Grondin, Shirley Grondin, Barbara Hayes, Thomas Hurst, BriAnna Jaksia, Brenda Kulon, Jeff Larson, Betty Learmouth, Paul Pratt, Sandy Rabideau, Bonnie Ross, Len St.Louis, Elaine Sinnott.